If you find it hard to live by your principles, then consider the plight of the mathematician Luitzen Egbertus Jan Brouwer at the beginning of the twentieth century. Brouwer had discovered he didn't agree with the way mathematics was being done. To make things right, much of mathematics would have to be rewritten from scratch. It would have been easy to keep quiet, but Brouwer rose to the challenge. His effort didn't gain him much popularity at the time and his ideas never did change mainstream maths. But they seeded an interesting movement which is still alive today: constructivism. 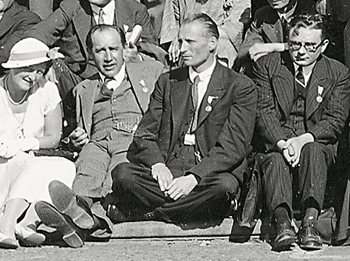 LEJ Brouwer, third from the left, at the International Congress of Mathematicians in Zürich in 1932. Brouwer's misgivings rested on his view on where mathematics comes from. Many mathematicians of the time (and of today) thought that mathematics exists independently of humans in some kind of Platonic realm of eternal truth, which we venture out to explore with our minds. Another prominent school of the time, the formalists, had stripped mathematics of all intuition and turned it into a game of pure logic, which, so Brouwer thought, was devoid of meaning. In Brouwer's view maths was neither independent of us, nor an empty game whose rules we can change at will. To him maths was a human creation rooted in our intuition. 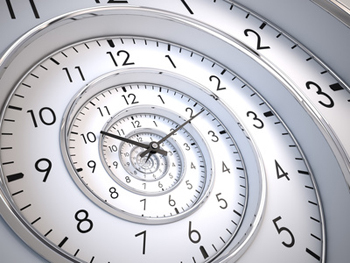 Our perception of the passage of time, he thought, with one moment following on from the one before, shapes our intuition of the natural numbers 1, 2, 3, etc, and of the infinity they move towards. Along with other notable mathematicians, Brouwer believed that the natural numbers formed the basis of all the mathematics we have created. Therefore, all mathematical objects and arguments should be regarded as mental constructions we build in the privacy of our own minds, based on our intuition. Logic, according to Brouwer, wasn't the essence of these private ideas, but it's what we use, together with language, to communicate about them. Esoteric as it may seem, Brouwer's intuitionist stance has stark consequences for everyday mathematics. If mathematical objects are mental constructions, then the only way of proving that a particular mathematical object exists is to give a recipe for mentally constructing it — since, according to Brouwer, "outside human thought there are no mathematical truths", if you can't construct an object in your mind, then it lacks reality. Many mathematical proofs, however, do no such thing: they show that something exists by logical necessity without telling you how to find it. which is rational, as required. For all its elegance, this proof doesn't give you a way of telling which pair of numbers — and , or and — actually have the required property. If your life depended on knowing the values of and , then this proof would leave you dead. Hidden within this proof is another principle Brouwer rejected, called the law of the excluded middle. Suppose that P is some statement (eg " is rational") and NOT P is its negation (eg " is irrational"). In classical logic the combined statement "either P is true or NOT P is true" ("either is rational or is irrational") is always considered true, even if you don't know which one of the two options is true. This makes sense, if it's not one then it has to be the other, but it's deeply unsatisfying. If I told you that either I will come to see you tomorrow or I will not, you couldn't accuse me of lying, but you'd be annoyed. Brouwer believed that our sense of time feeds out intuition of the natural numbers. Intuitionists treat the statement "either P is true or NOT P is true" accordingly: they see it as meaningless unless you have constructed, in front of your mental eye, a proof of one of the two components. You shouldn't build mathematical proofs, or plan your personal life, according to empty statements such as " is rational or is irrational" or "I'll come to see you tomorrow or I won't". The law of the excluded middle affords mathematicians a bread-and-butter technique they use almost every day: proof by contradiction, which shows that a statement P is true by showing that its negation NOT P must be false, but without constructing an explicit proof of P. A famous example is the proof that is an irrational number (see here). The idea of rejecting the law of the excluded middle, and hence many proofs by contradiction, spooked (and still spooks) mathematicians considerably. As the famous mathematician David Hilbert remarked in 1928, "Taking the law of the excluded middle from the mathematician would be the same, say, as proscribing the telescope to the astronomer or to the boxer the use of his fists." To Brouwer, however, the law of the excluded middle was outdated mathematical folklore, to be considered "as a phenomenon of the history of civilisation of the same kind as the former belief in the rationality of , or in the rotation of the firmament about the Earth." He and his followers revised the laws of logic to reflect their ideas and proceeded to develop mathematics in an intuitionist way. Today we use the term "intuitionism" to refer to Brouwer's particular brand of constructivism: a school of thought that also rejects the law of the excluded middle and requires all mathematical objects to be explicitly constructed. Some of the consequences of the constructivist approach are startling, at least at first sight. Consider a statement we absolutely take for granted in normal maths: "Every real number is either equal to 0 or it is not". A constructivist would only agree if given any you can definitely decide which of the two alternatives it is. But a real number can have an infinitely long decimal expansion. Since it's humanly impossible to check such an expansion all the way to infinity the statement seems doubtful indeed. The Goldbach conjecture asserts that every even number greater than 2 can be written as the sum of two prime numbers. So far, nobody has managed to prove it, though it has turned out to be true for all even numbers people have been able to check it for. Now define a real number as follows. The first digit of , which is the digit before the decimal point is . Then define the digit after the decimal point to be if the Goldbach conjecture holds for every even number less than or equal to . If it fails for some even number less than or equal to , then the digit of after the decimal point is . This is a perfectly valid definition of a real number, even in the constructivist sense: we are given a finite recipe for computing every one of the number’s digits. Clearly, if and only if the Goldbach conjecture holds for all even integers, that is, if and only if the Goldbach conjecture is true. Since we do not know if the Goldbach conjecture is true, we cannot at this moment say whether or not. To bring this idea home Brouwer found a way of defining real numbers in terms of certain unsolved maths problems — problems that had puzzled the best minds for decades or even centuries. Given such an unproven mathematical conjecture, Brouwer defined the corresponding real number so that it's zero if the conjecture is true and non-zero otherwise (see the box for an example). Since we don't yet know if the conjecture is true or false, and may not know it for a long time to come, we definitely can't say whether the real number is equal to zero or not. Thus, the general statement "every real number is either equal to 0 or it is not", and by extension the law of the excluded middle, has "no mathematical reality" as Brouwer put it. This argument is called a weak counterexample to the claim that every number is either 0 or not (and to the law of the excluded middle). It's a counterexample because it suggests (according to Brouwer) that the statement doesn't generally apply. But it's only a weak counterexample because it's time-dependent: as soon as someone solves the maths problem associated to the real number, we can definitely decide if the real number is 0 or not, so the argument ceases to be a counterexample. But in that case there'll still be other counterexamples, linked to different unsolved problems. No law of the excluded middle, not being able to assume that a number is either 0 or not — that doesn't bode well. So does standard mathematics still stand up to the intuitionist/constructivist approach? Find out in the second part of this article.